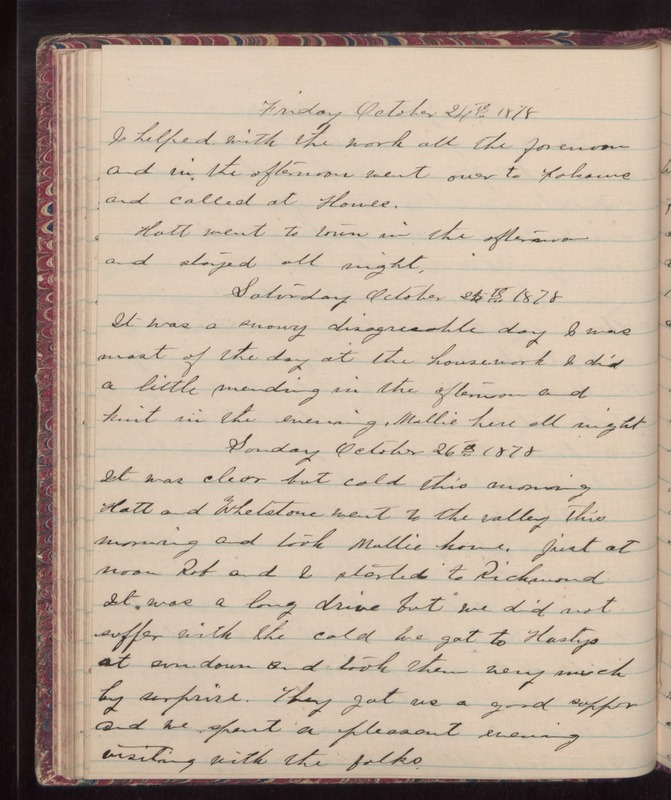 Friday October 24th 1878 I helped with the work all the forenoon and in the afternoon went over to [Fohaurs?] and called at Howes. Hatt went to town in the afternoon and stayed all night. Saturday October 25th 1878 It was a snowy disagreeable day. I was most of the day at the housework. I did a little mending in the afternoon and knit in the evening. Mollie here all night. Sunday October 26th 1878 It was clear but cold this morning. Hatt and Whetstone went to the valley this morning and took Mollie home. Just at noon Rob and I started to Richmond. It was a long drive but we did not suffer with the cold we got to Hastys at sundown and took them very much by surprise. They got us a good supper and we spent a pleasant evening visiting with the folks.